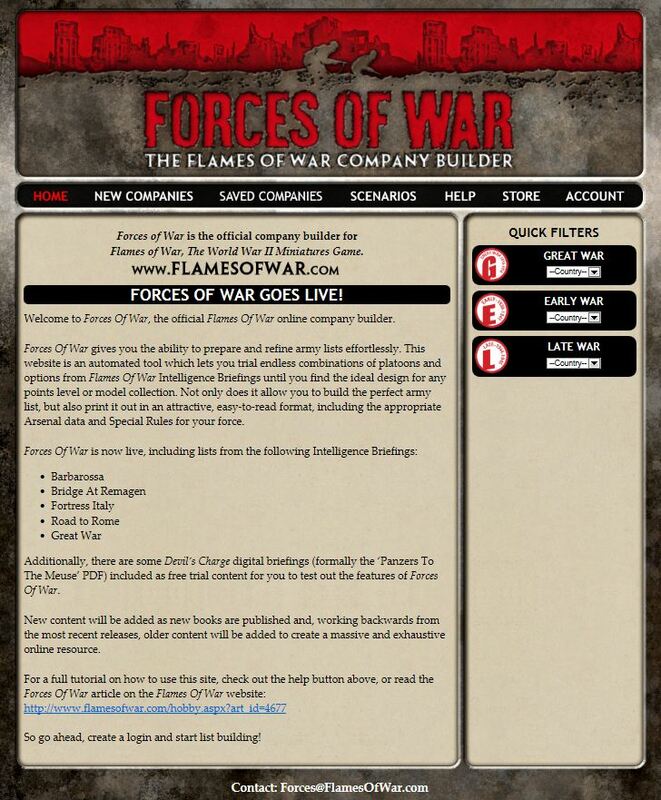 This month, Battlefront Miniatures, the makers of the popular World War II miniatures game Flames of War, took its first big digital step forward with the introduction of the first of their two new digital services — Forces of War. 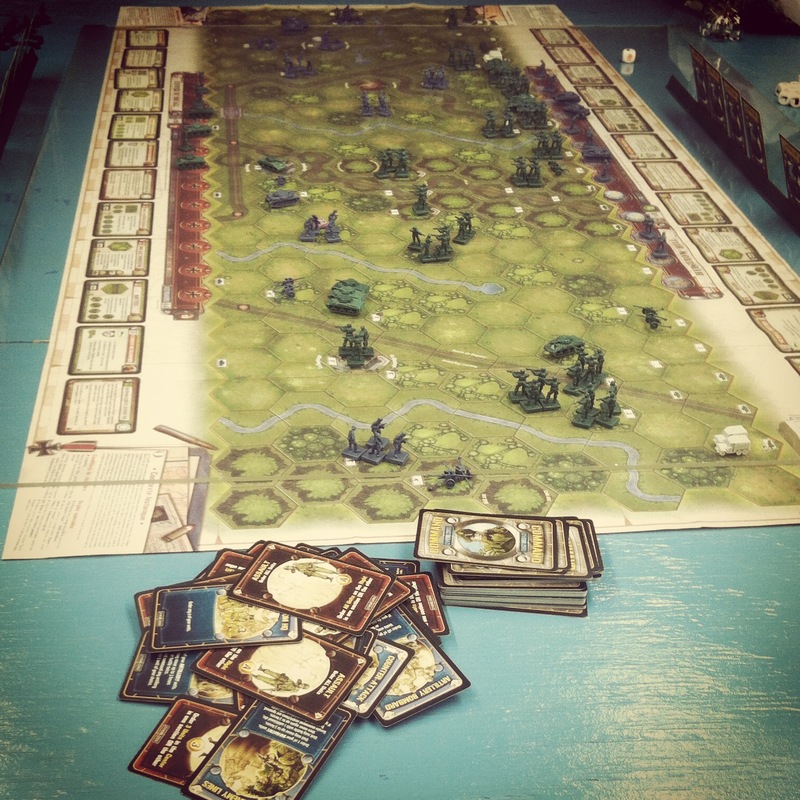 Debates have been raging through online message boards, Facebook groups, Twitter and over WWII-themed tabletops ever since the announcement that the beloved EasyArmy was being closed down and absorbed into Battlefront with Forces of War. 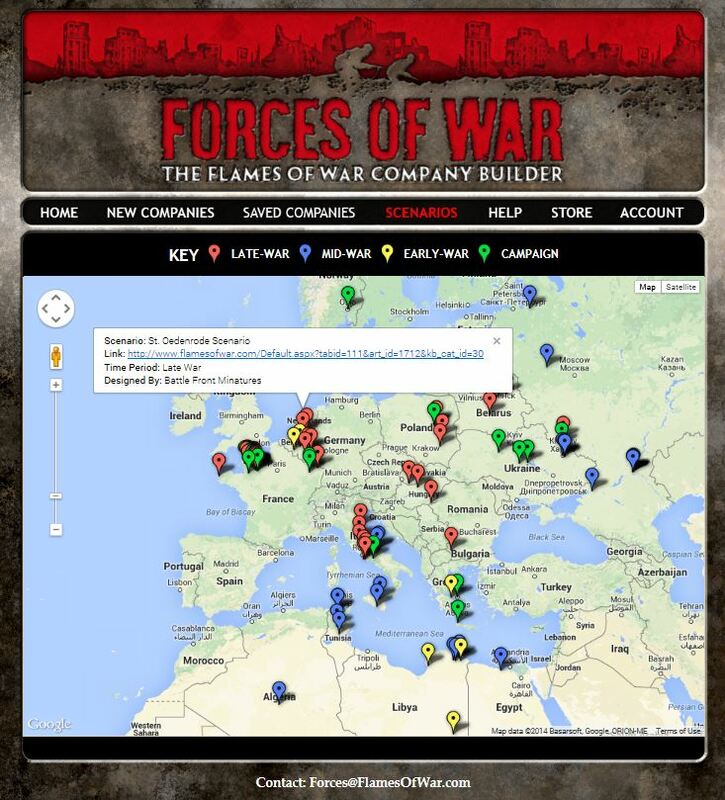 During its run, EasyArmy had become a much relied-upon tool for FOW players worldwide. Battlefront has maintained a lengthy working relationship with EasyArmy’s designer in an incredibly rare example of a corporation willing to cede some control of their intellectual property. Now, like so many other companies working in the digital space today, Battlefront has brought the ideas and work of a passionate outsider in-house with this month’s launch of Forces of War. Beginning with Forces of War, buying a company list will run $1.00 USD with a 25% discount extended when buying all lists from an entire book or compilations at about $16.50 USD. The initial offering of lists is meager, focusing on the more recent FOW books Road To Rome, Barbarossa, Road To Remagen and the World War I themed Great War. Devil’s Charge is listed but the complete book is not available and instead points to the popular Panzers To The Meuse list. This set of German companies is the only free offering at launch, allowing for some limited experimentation with the site before buying additional lists. 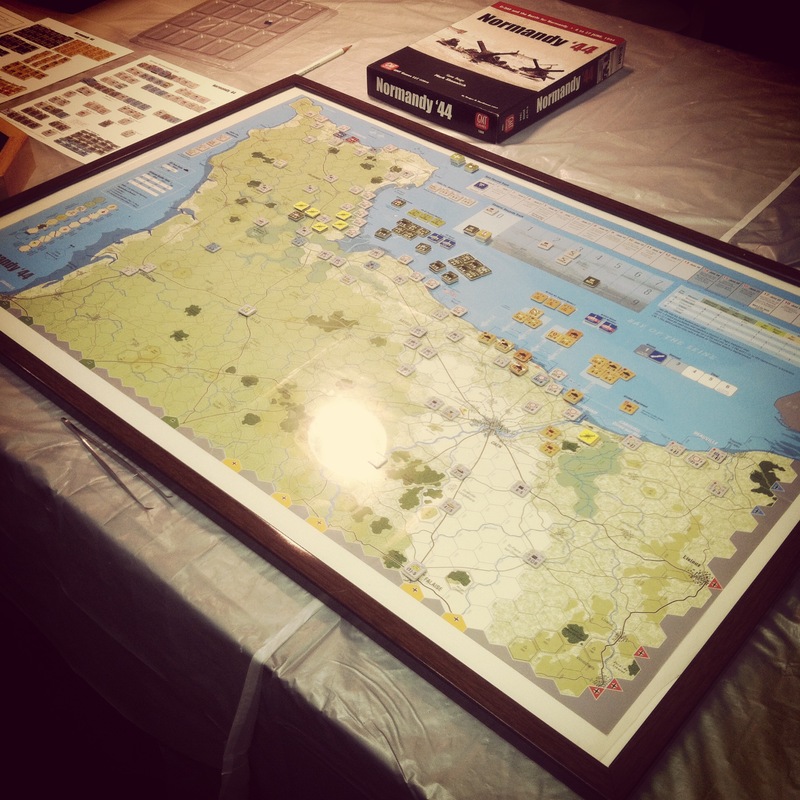 Being a Late War player who mostly plays US and British lists of the D-Day, Market Garden and Battle of the Bulge operations, my hope is that FOW quickly updated Forces of War with these lists as well as Eastern Front lists for Late War Russian and German players. As a test, I went through the quick PayPal process of buying the US 92nd Infantry list from the Road To Rome book. The performance was familiar to my experience on EasyArmy, although I did find the Forces of War site to be somewhat faster than its predecessor. Within a platoon, options are selected with simple clicks, and a running points total is tracked along the top of the page by company and platoon. Forces can be saved with custom names and a nice (but minor) new feature allows notes to be added within each platoon. Saved companies are accessed through easy to view lists which can be filtered by period, country, type, name, source, motivation and skill. Companies can be exported and saved as PDFs or printed. The printed lists are somewhat clearer with better page breaks than those with EasyArmy, a simple but welcome tweak. Frustratingly, the platoon motivation and skill ratings still print within unnecessarily colored text boxes which are nearly unreadable on the page. Most other aspects of EasyArmy have been ported over to Forces of War, including the handy Scenarios map. The Scenarios page could use some upgrades with a search or menu feature to allow quicker access and some better designed graphics or links. 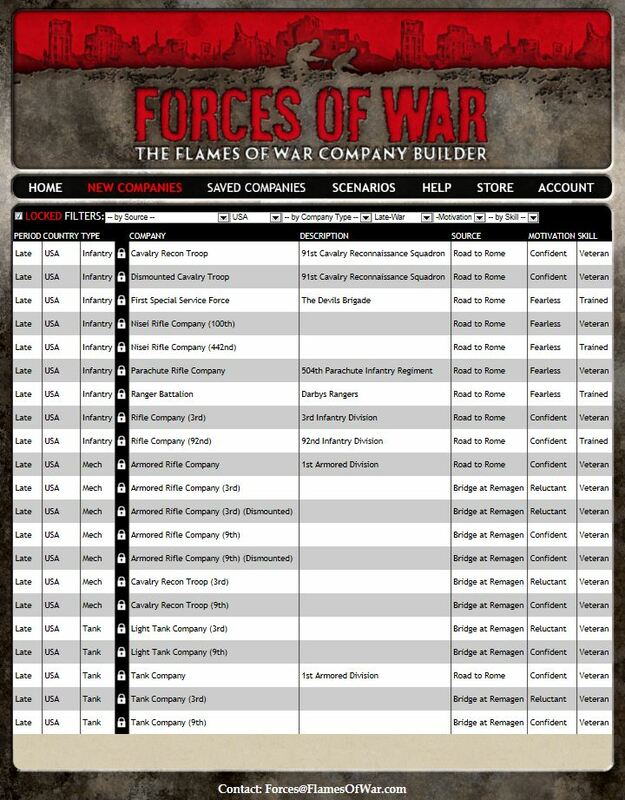 Much like EasyArmy before, Forces of War offers an easy interface in which to view and manage force lists for FOW. In a nutshell, all the core functionality of EasyArmy has been preserved and then packaged with an official FOW wrapper. Like a lot of players, I would have very much liked to have seen more lists available at launch. 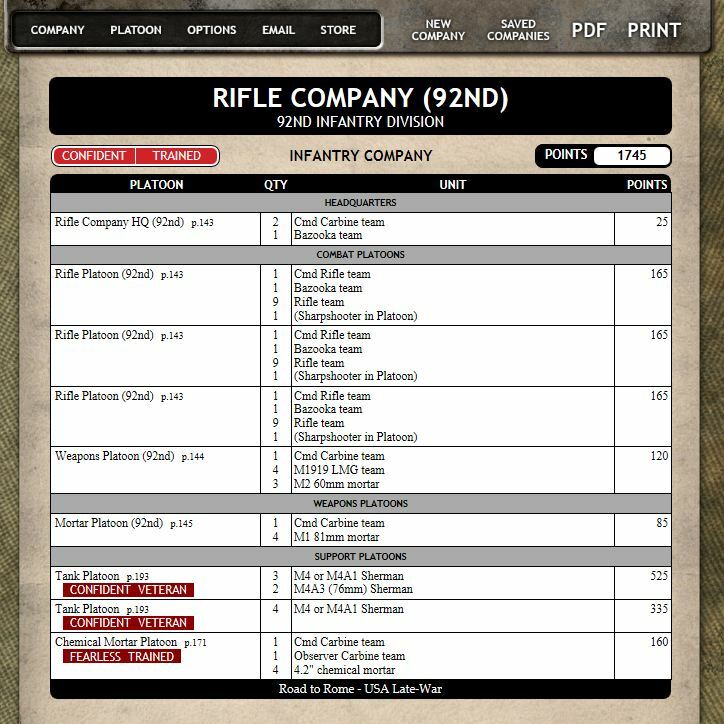 As more lists become available in the coming months, re-buying lists already purchased via EasyArmy is also a sticking point for many but I find the new pricing scheme to be completely in-line with FOW balancing customer usability with needed company profit. Some will also continue to complain about the inaccuracies in some lists, but clean-up edits over time, cross-checking the books and being a considerate, mindful and fair player will always trump any gaming tool. 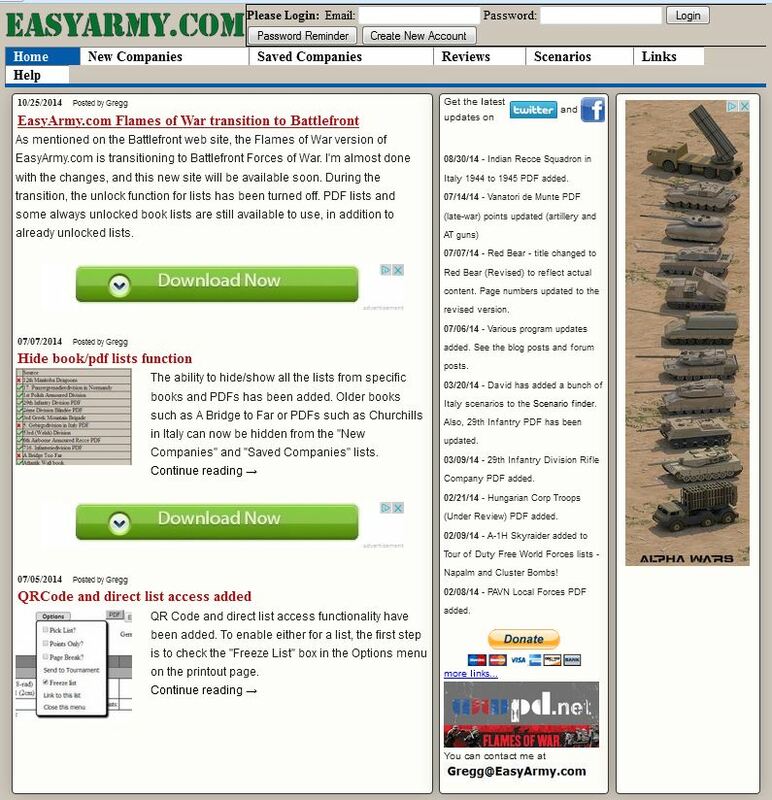 Gone too are all the ads which cluttered the layout of EasyArmy — a true step forward for any premium digital offer. 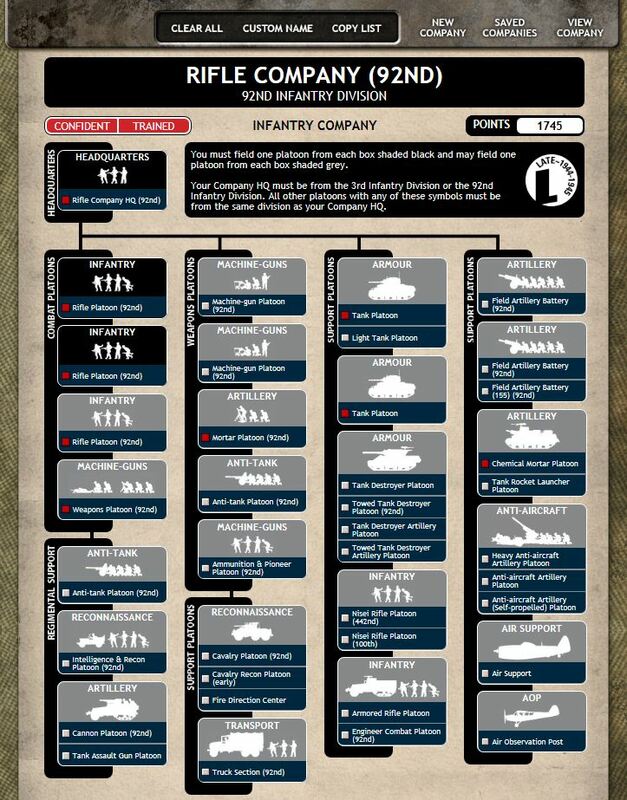 As transitions go, the evolution of EasyArmy to Forces of War is a good start with room for greater improvements to hopefully occur in the very near term. 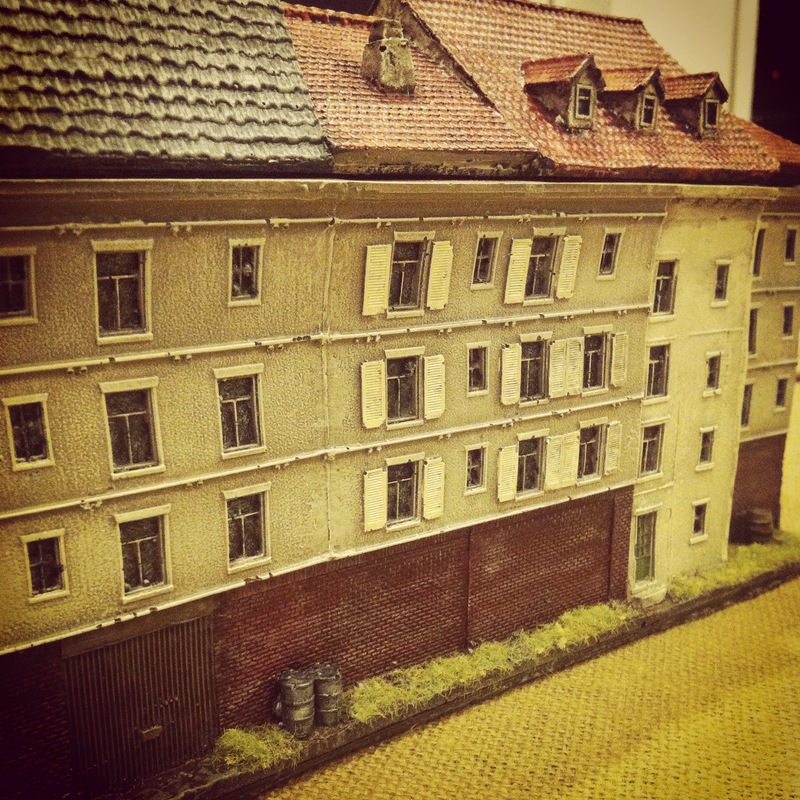 I picked up two different 15mm JR Miniatures Arnhem row house models on my recent trip to the HMGS Fall In! 2014 convention at a real steal of 40% off the list price. 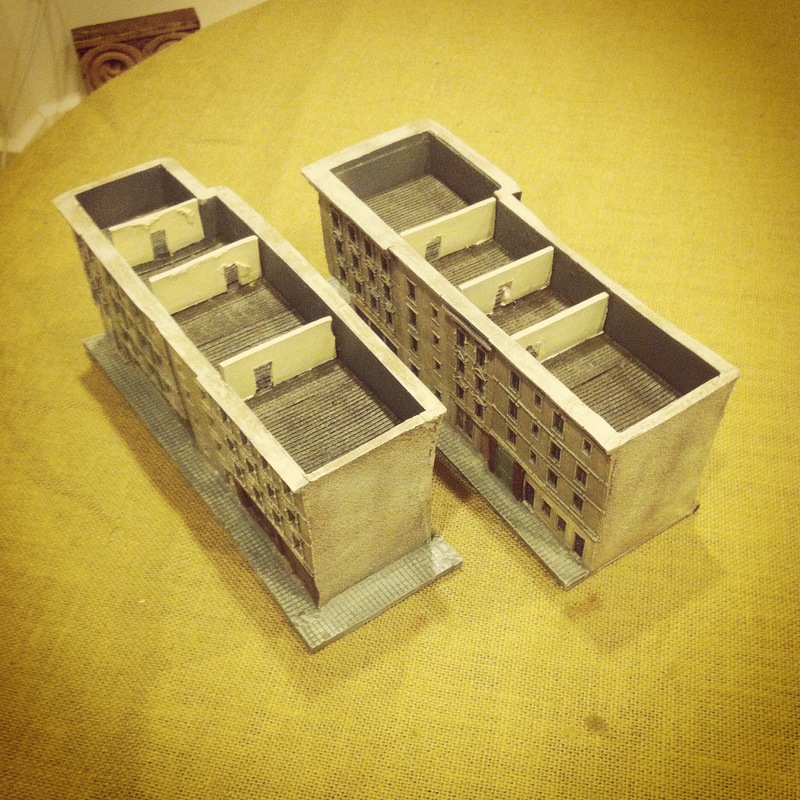 At nearly 12″ long and up to 8″ tall, these cast resin models create a quick urban feel to a tabletop battlefield. 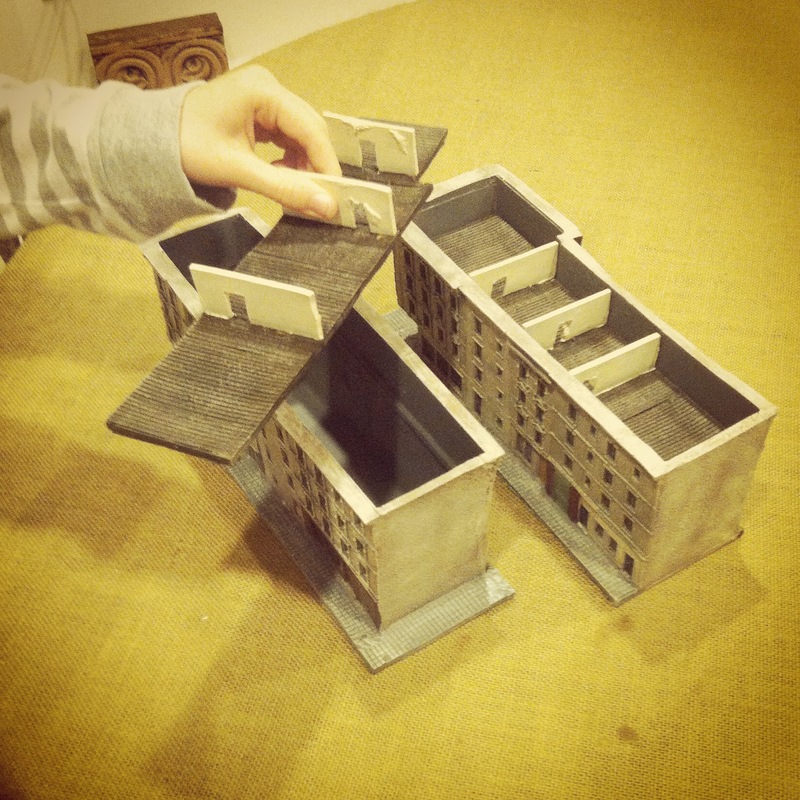 Each model has lift off roofs and interior floor and wall sections which pull out to allow for stands of troops to occupy varying rooms and levels. 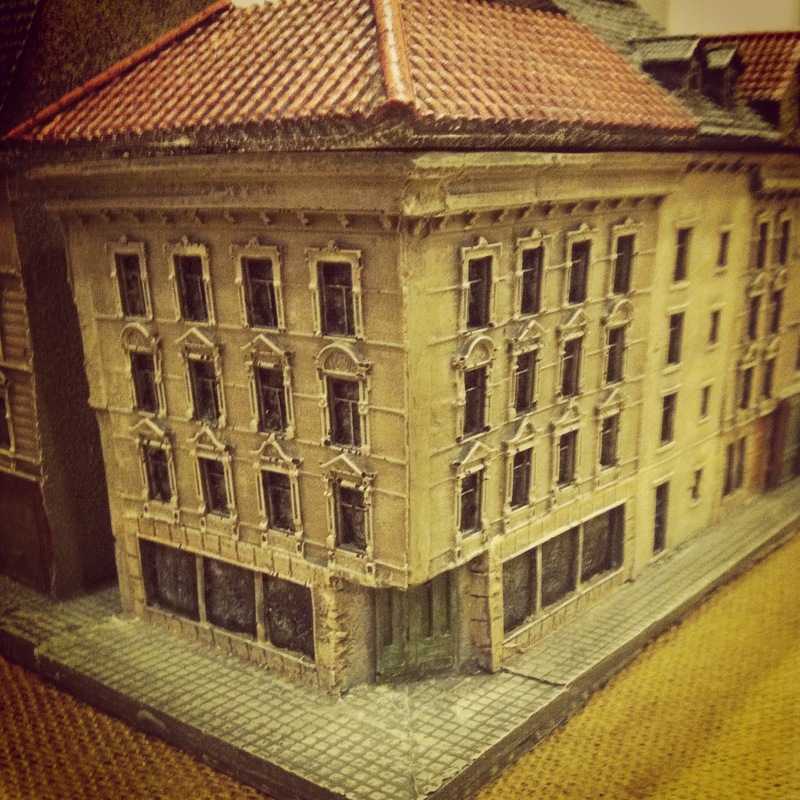 The roofs on the models also contain open parapet areas where artillery spotters, machine gunners or other troops can placed to command the battlefield from high upon the rooftops. As with most of my experiences with JR Miniatures models, there’s a fair amount of clean up to flash before getting started. The castings also contain a few air holes here and there, but nothing that detracts too much from the overall models. If anything, missing pieces of a cornice or a small hole in a wall might be chalked up to gunfire. 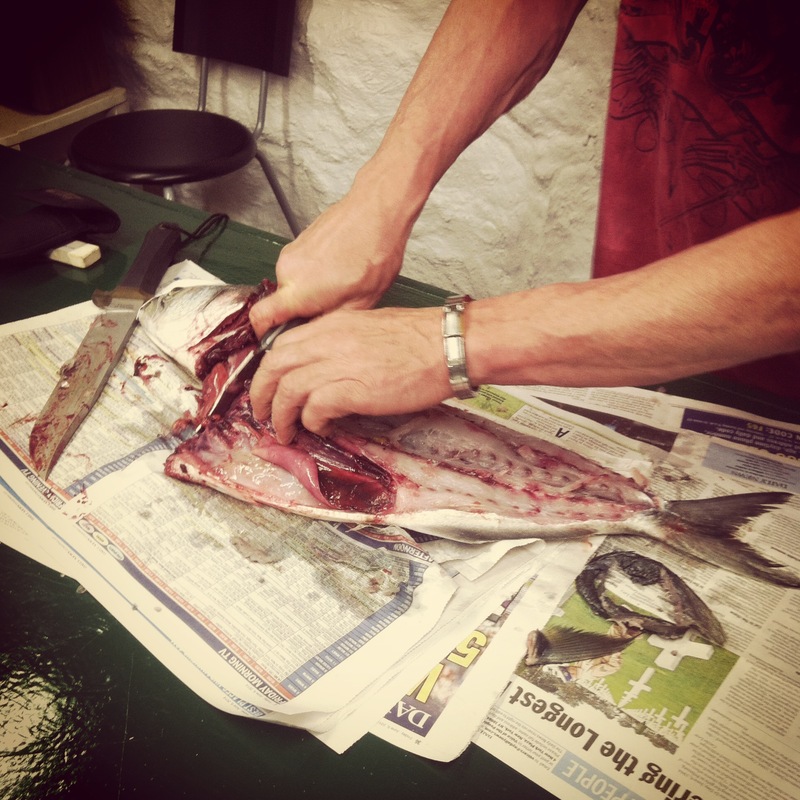 Use a sharp hobby knife to carefully remove extra resin flash from casting. Particular care should be taken to make sure interior floor sections lift out of the model easily. 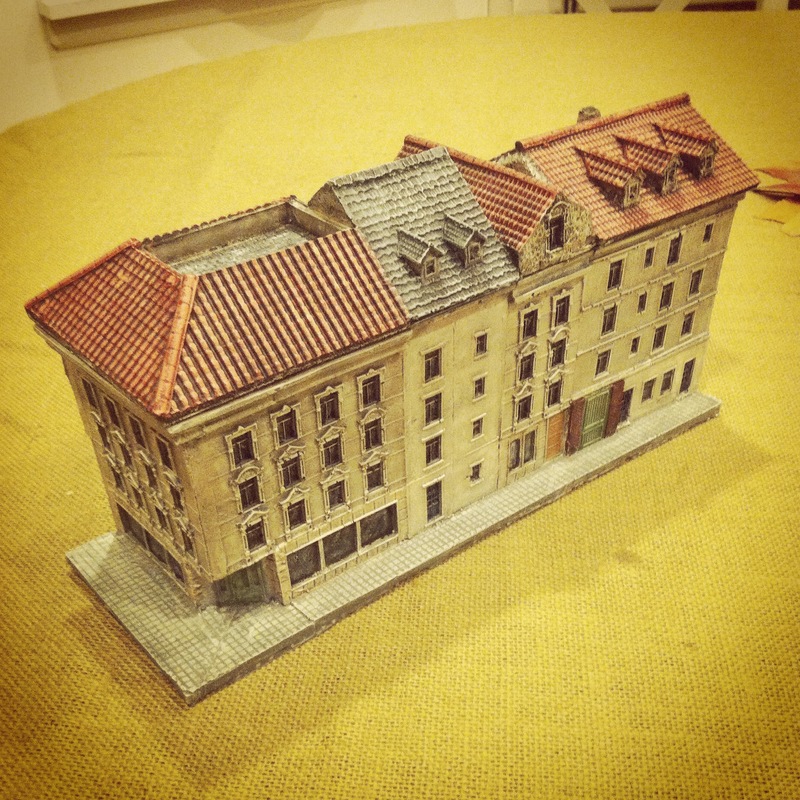 Wash models in warm soapy water to remove molding residues. Allow models to dry overnight. Spray prime roof and removable interior floor sections in flat black and main building sections in flat grey. Allow primer to dry overnight. Tile roofs begin with a dry brush of 50/50 black and red paint, followed by a dry brush coat of red paint and finished with a dry brush of orange paint to highlight. Shingled roofs begin with a dry brush of dark grey, followed by dry brushed coats of lighter browns, light greys and dark green. Stuccoed areas in roof gables and dormer windows receive a dry stipple brushed coat of light brown followed by off-white paint dry brushed with the same stipple brush. Dry brush floorboards with layers of dark and lighter brown paints. Paint wall sections in off-white paint. Stucco walls receive a dry stipple brushed coat of light brown followed by off-white paint dry brushed with the same stipple brush. Dab some random areas with more off-white to create areas of more fresh stucco to create variations along the street. Dry brush a slightly heavier amount of off-white paint over cornices and door a window molding to create more depth of highlights. Stone areas receive a dry brush of light grey followed by off-white dry brush highlights and a dark brown wash in recesses. Brick areas are dry brushed with 50/50 black and red paint followed by random dry brushing in off white paint to highlight. Paint doors and shutters with a variety of blues, whites, greens, reds and browns. Follow basecoat with highlight in same color slightly lightened with off-white. Dab doorknobs with brass paint with a fine brush. Window panes are all carefully given a light coat of black and then dry brushed with dabs of lightly dry brushed white paint to give the illusion of glass. Sidewalks are dry brushed with light greys over a medium grey basecoat. Ground areas at the rear of the buildings receive brown and green dry brush coats followed by grass flocking and small clumps of foliage. Coat models in several layers of spray clear matte finish, allowing each coat to dry before applying an additional coat. 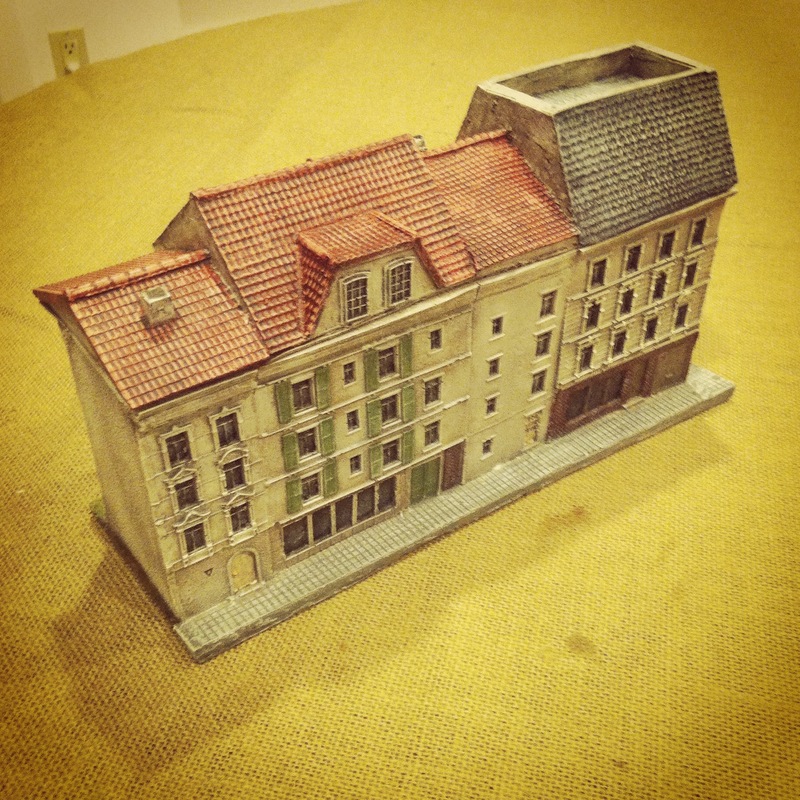 I was able to achieve a pretty decent tabletop quality finish to my buildings with maybe three hours of work on each model using the painting scheme above. Since colors on buildings are rarely monotone (unless newly constructed), I use a plastic surface on which I dab a variety paint shades and mix colors from this palette as I go with my dry brushing. I then build up areas with heavier amounts of one color or another to pull out highlights, create varying textures and differentiate from one building to the next along the street. 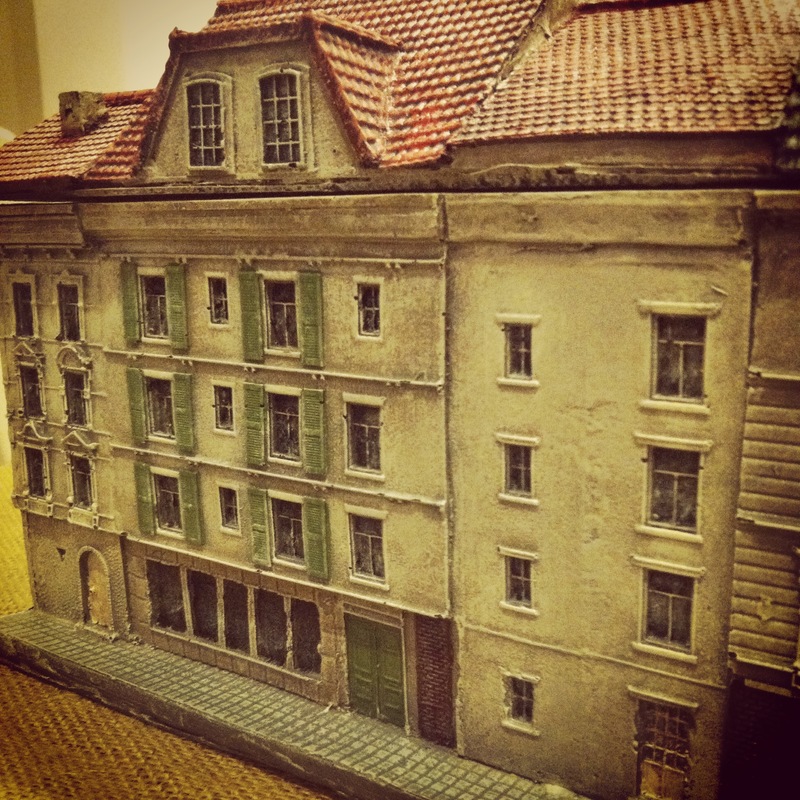 I’m really excited about these models which nearly double the footprint of my existing Western European buildings in 15mm. 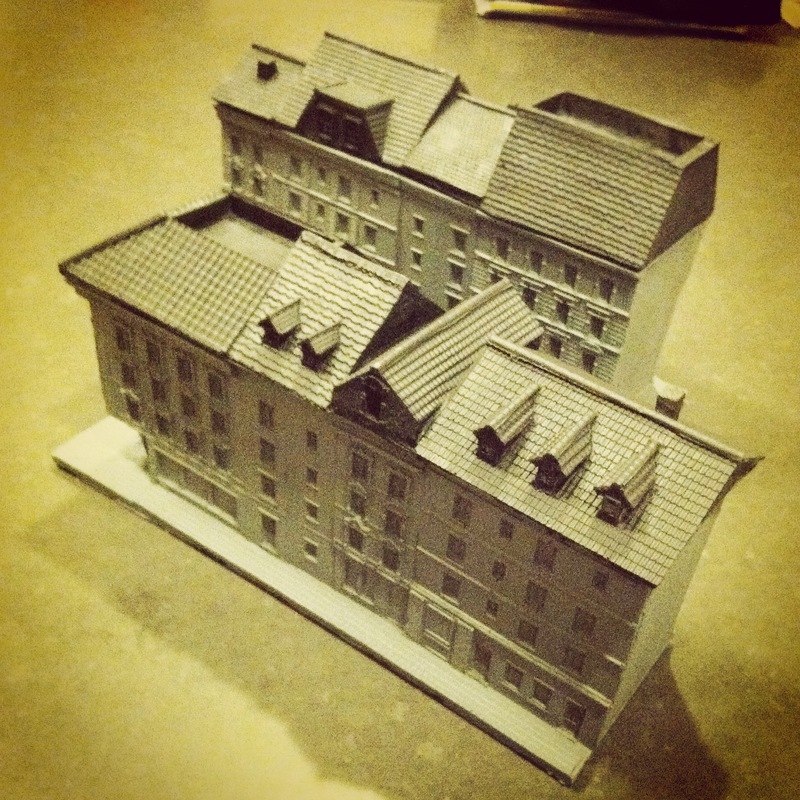 Models from JR Miniatures fit in nicely with my buildings from Mark IV Miniatures and terrain from a variety of other manufacturers. 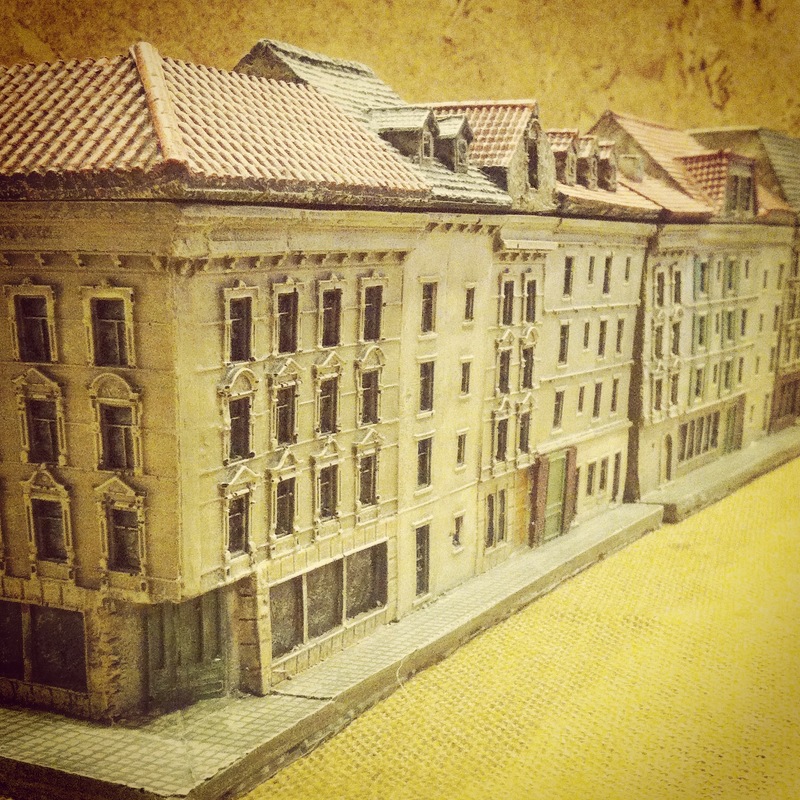 Although modeled on actual streetscapes of Arnhem, the buildings are easily usable in creating the look of many densely populated areas of France, the Netherlands or elsewhere in Western Europe during late war operations. 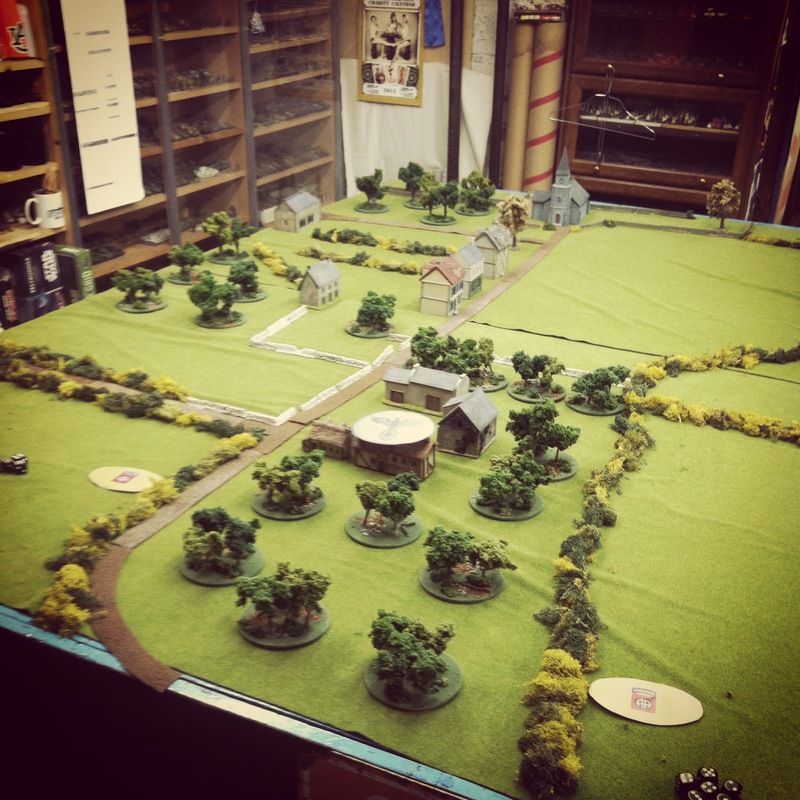 Two weekends ago we kicked off a Flames of War Infantry Aces campaign at Metropolitan Wargamers in Brooklyn, NY. 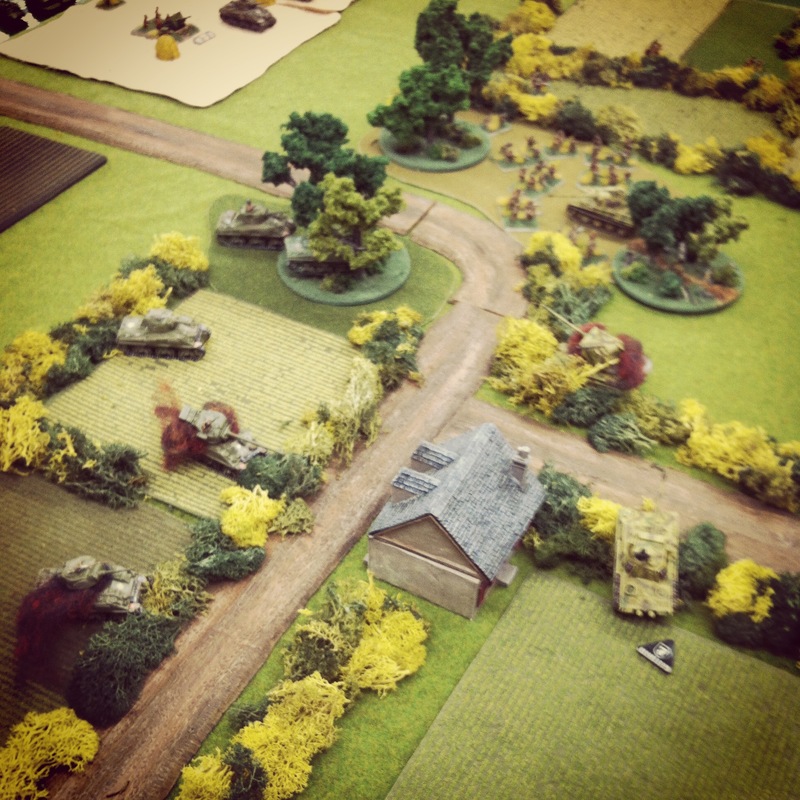 A friend of the club and organizer of the campaign has created a special Infantry Aces blog to track the campaign’s progress throughout the summer. 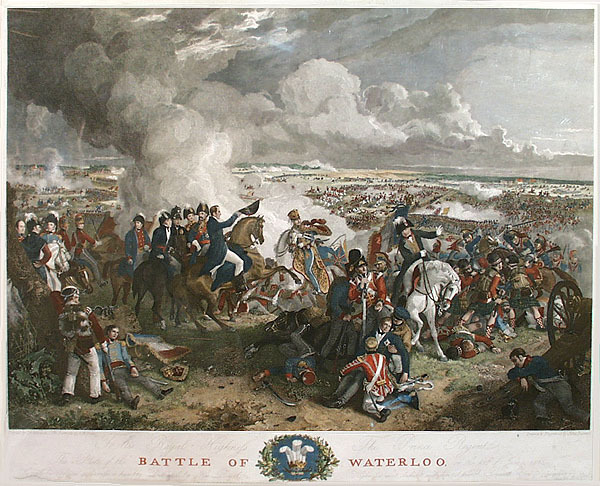 The site will be updated weekly as the battle unfolds with after action reports, lots of photos and tracking of each player’s progress in the campaign. 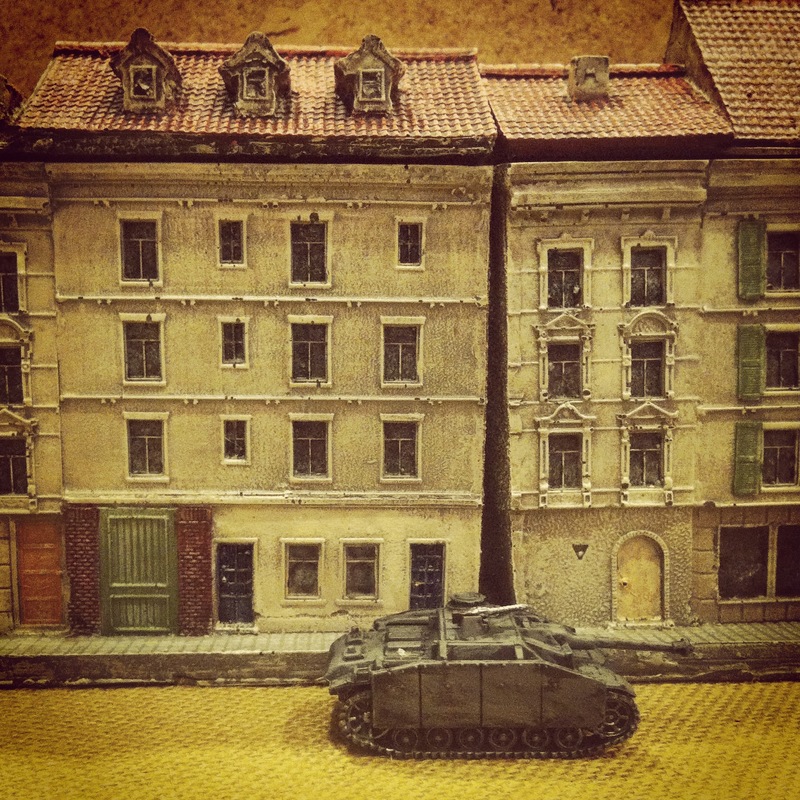 While the battle rumbles on, here’s a brief look at the forces we’ve had fun researching, modelling and painting specifically for our campaign for Italy. 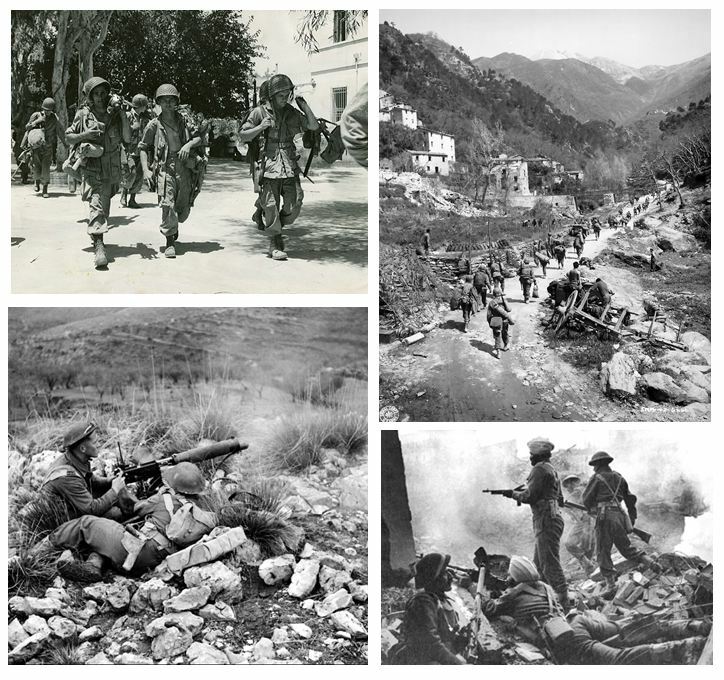 Our Allied forces are a mixed group from the Road To Rome book and reflect the mutlinational forces which came together in the late war Italy campaign to break the Axis lines. From the United States, the 504th Parachute Infantry Regiment is bringing their experience to the field after having fought for years from North Africa and Sicily in 1943 to Operation Market Garden to The Battle of The Bulge in 1944. Joining them, are the untested 92nd Infantry Division “Buffalo Soldiers,” the first African-American infantry to fight as wholly-segregated unit in the war. Allied with the US troops are some unique UK Commonwealth forces. The Indian Gurkha Rifles had a long history in service of the British dating back to the mid-19th-century, and their skill in close combat and rocky terrain would serve them well in Italy. The 2nd New Zealand Division served most of the war in North Africa and hopping around the islands of the Mediterranean until joining the Allied effort to break the Axis lines severing Italy from the rest of Europe. 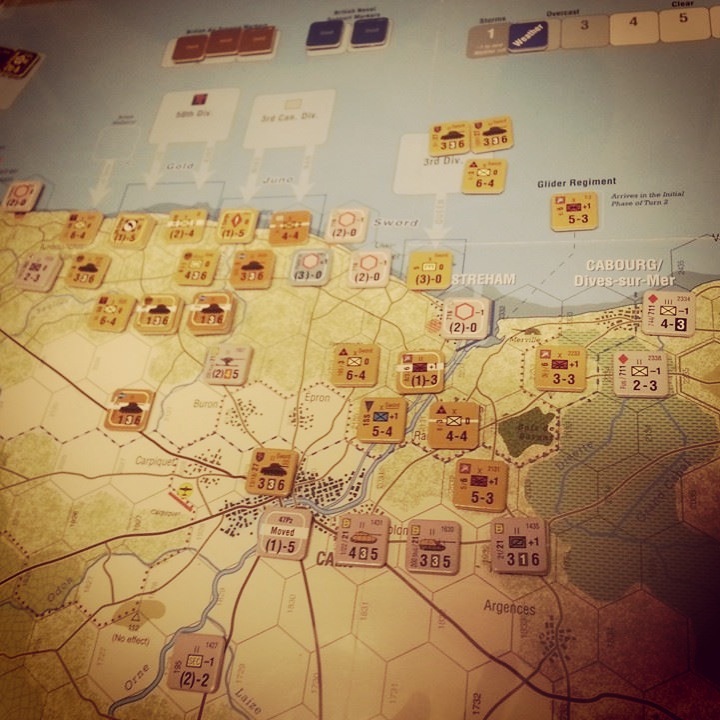 Using the updated Fortress Italy book, our Axis players have fielded some of the classic, war-hardened forces whose mission it was to hold the line against the Allied push up the Italian Peninsula. The 1. 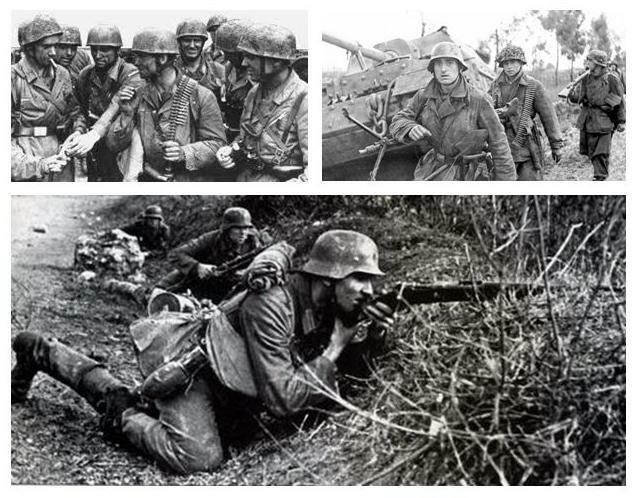 Fallschirmjägerdivision in Italy had already proven themselves throughout Europe with wide-ranging early war operations in Denmark and Norway, the Netherlands, Crete and the invasion of the Soviet Union with Operation Barbarossa. 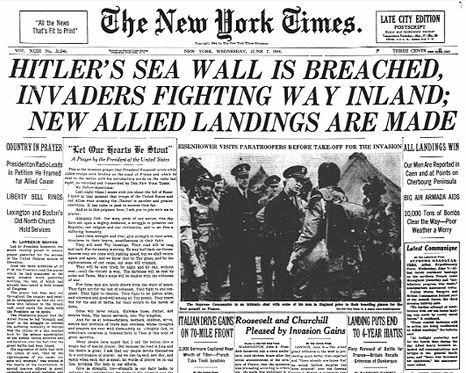 Two other veteran companies fill out the Axis forces. 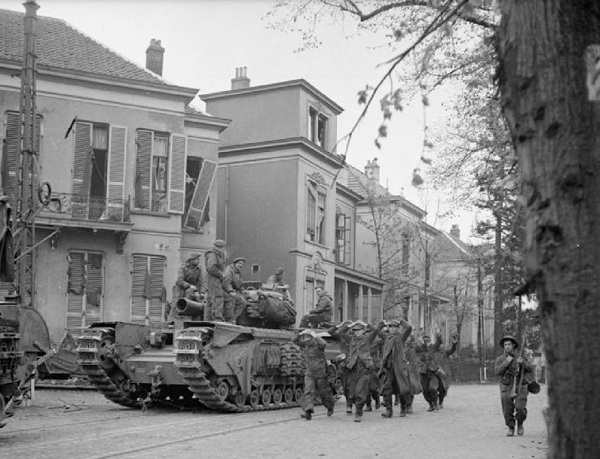 The Hermann Göring Fallschirmpanzerdivision saw action throughout Europe and Africa before fighting in Italy. 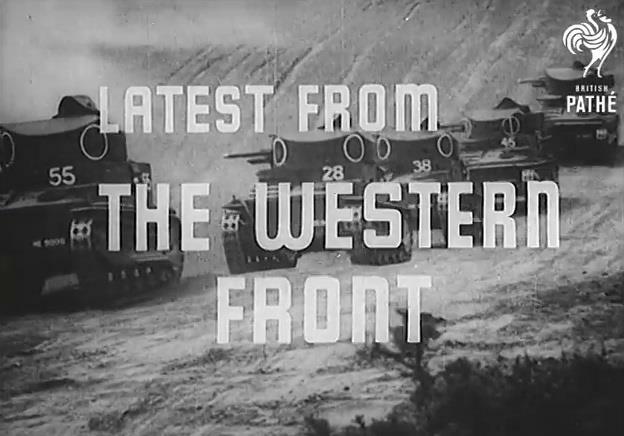 Finally, the 362.Infanterie-division had seen a long war (including the Battle of Stalingrad) by the time they joined the final Axis defense of Italy. 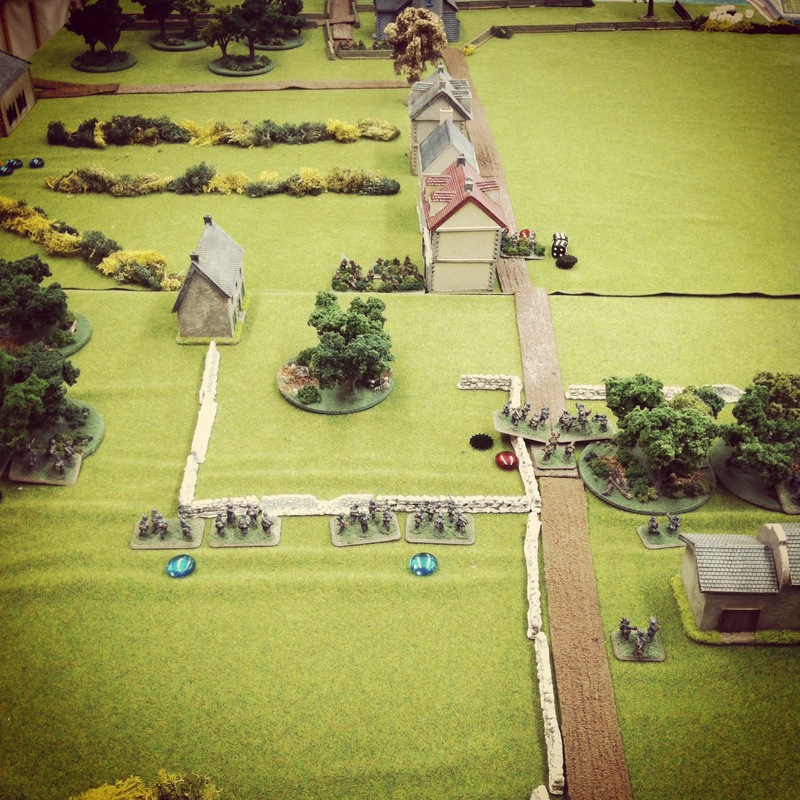 We’ve got two weeks of campaign games in so far, and playing with small infantry forces of 500 points has been a refreshing break from the larger FOW games in which we all usually play. 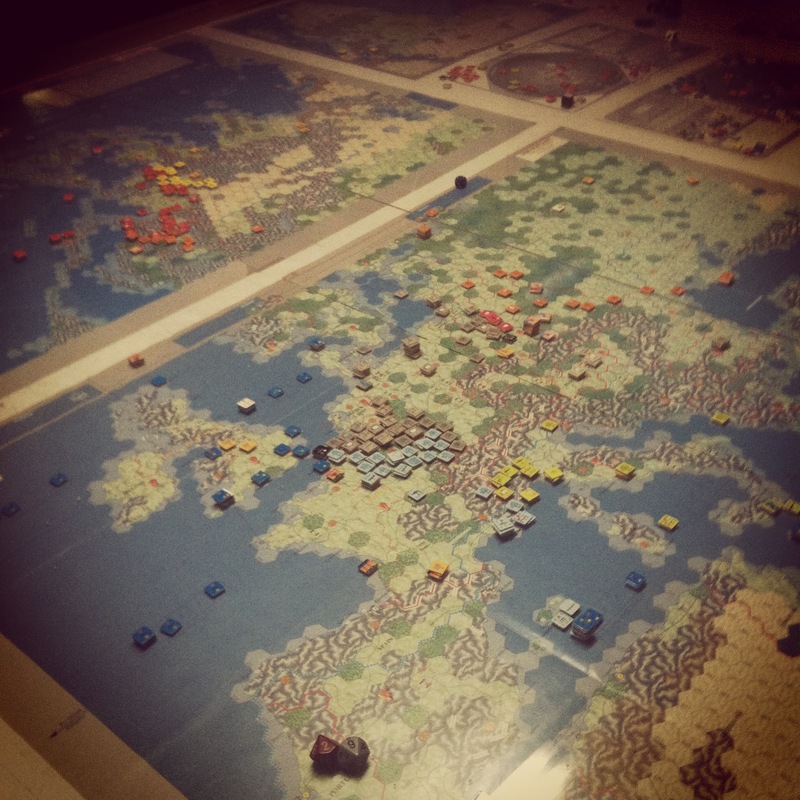 Special rules, varying troop ratings and small tables clogged with Italian terrain have also added to the challenges and enjoyment we’ve all had so far. There’s a lot of gaming to do as the campaign escalates over the coming weeks to 700 and 900 point companies with added support. 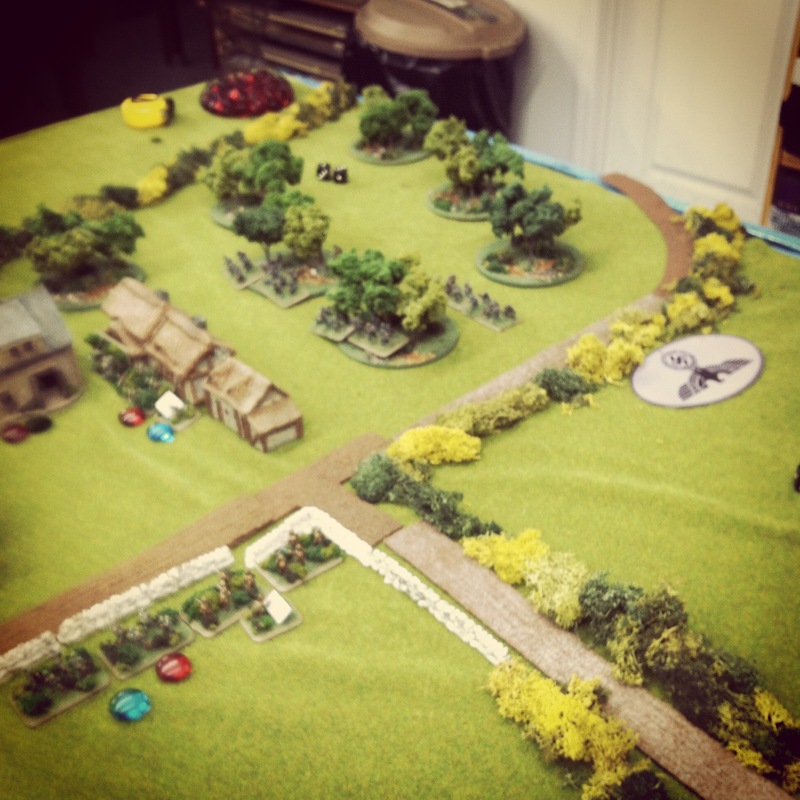 Check back frequently for more of the action over at the Infantry Aces Metropolitan Wargamers Italian Flames of War site. I’m about 10 years late to the WWII board game Memoir ’44, but after a few first plays through it this past weekend I’m glad this modern classic is now part of my gaming arsenal. 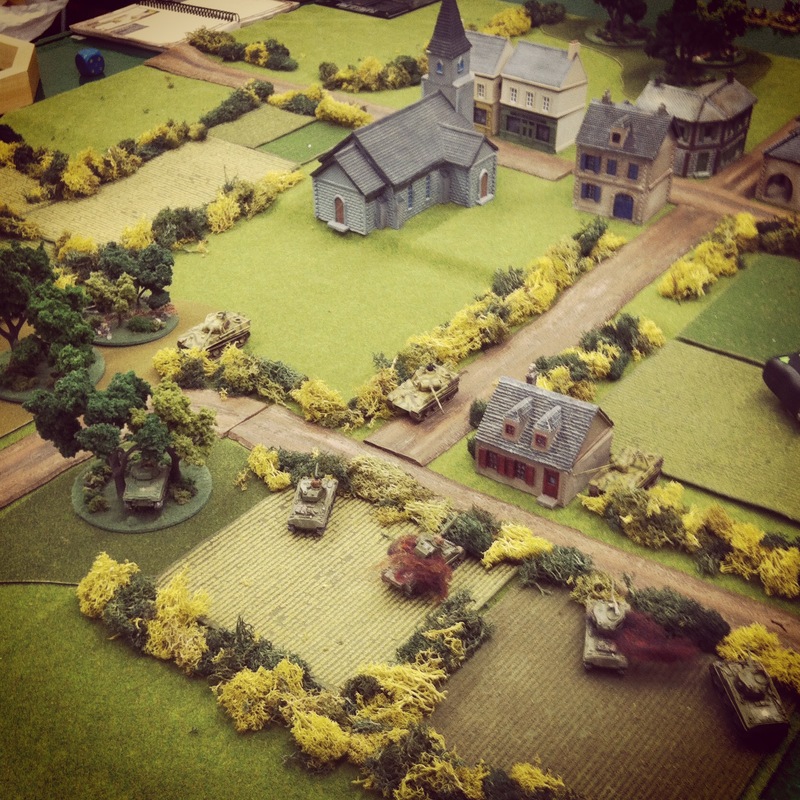 Released by Days of Wonder on the occasion of the 60th anniversary of the D-Day Normandy Invasion in 2004, the game has won numerous awards and remains high in the esteem of casual and serious wargamers alike. 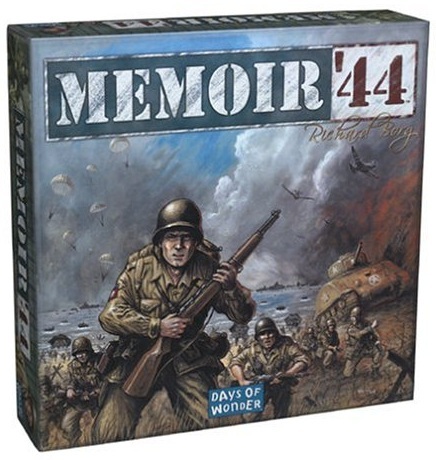 The base Memoir ’44 game runs about $40 and contains over 300 playing pieces. The blue-grey Axis and green Allies tank, infantry, artillery and defensive features look fantastic, and playing with them evokes the little plastic toy soldiers of many a kid’s youth. 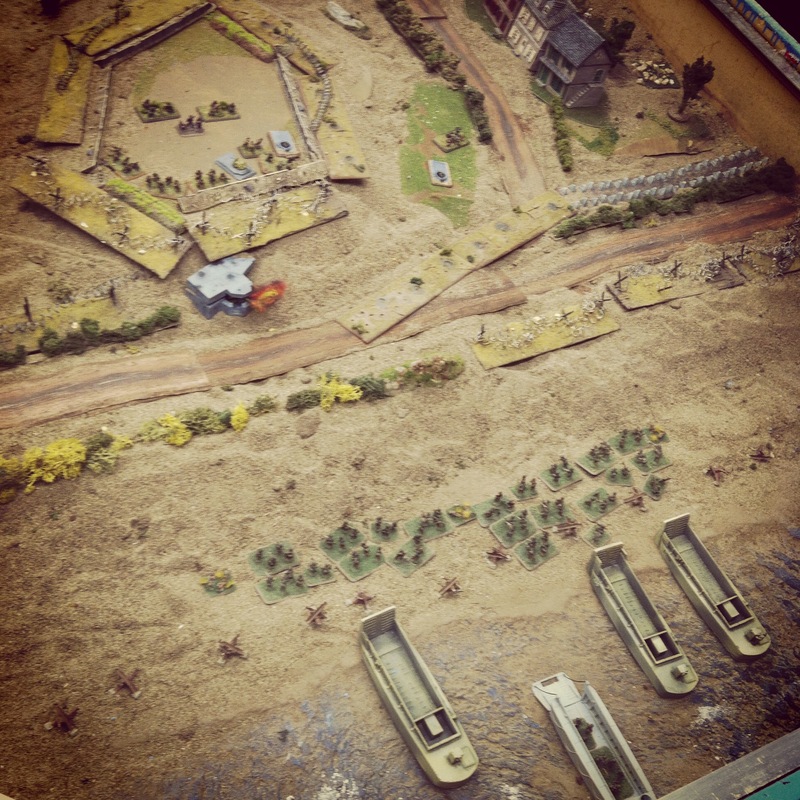 The reversible game board with a beach on one side and countryside map on the other provides the basic layout for the more than a dozen historic scenarios included in the easily-read rulebook. 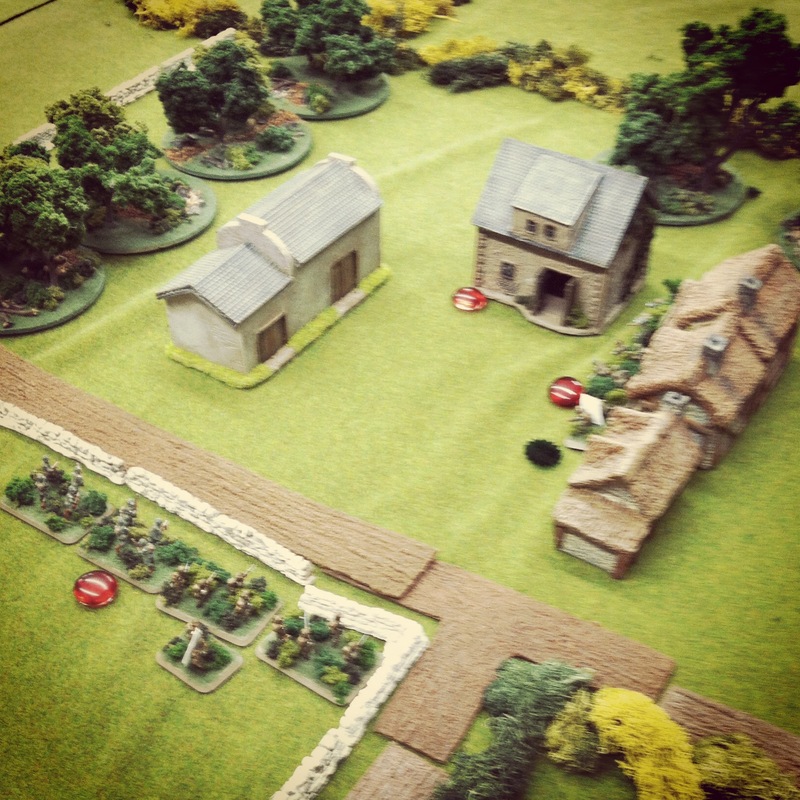 Scenarios are laid out using hex tiles with various terrain features such as towns, forests, hills, rivers and hedgerows. 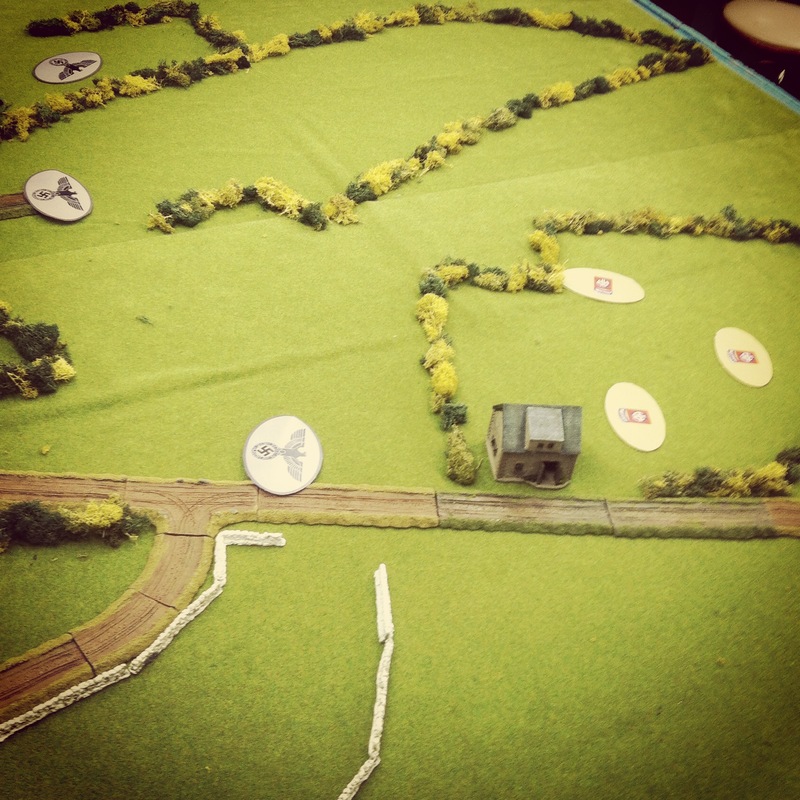 Each historic game scenario is presented with a clear illustration on how to lay out the appropriate terrain tiles and initially deploy forces on each side. Command cards and battle dice provide the basic drivers of game mechanics. Cards provide activation of one or more units in the left, right and/or center portions of the board. 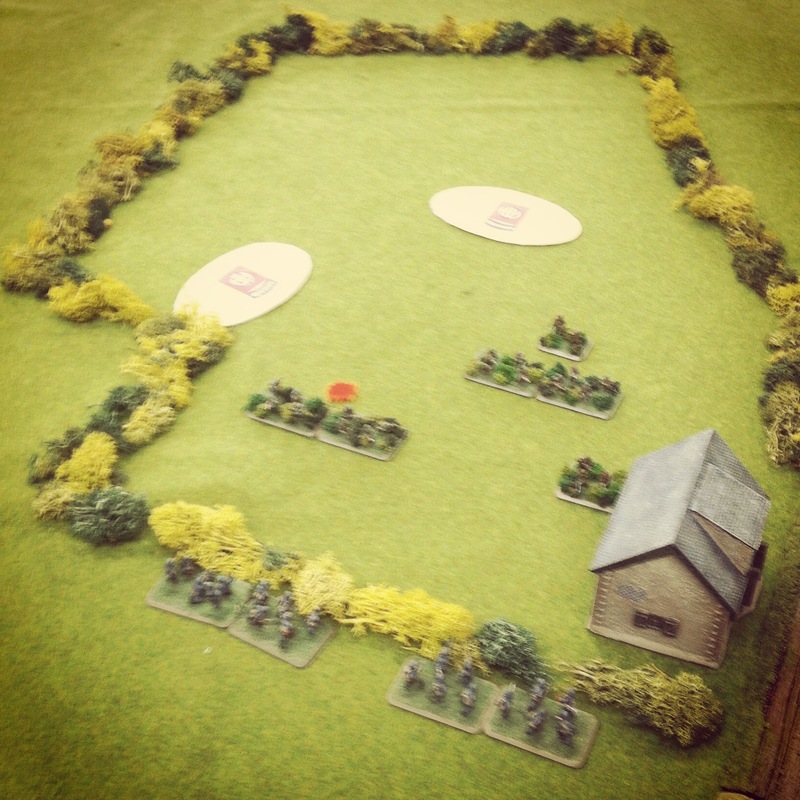 Infantry may move once and attack or move twice, artillery may move or shoot, and tanks may move up to three hexes and engage in combat. Attacks are resolved with a simple roll of special battle dice which hit units based on the icon results on each die face and what units are present in the combat. Die rolls may also result in misses of forced retreats. When a player finishes their moves and combats, they draw a fresh card and play passes to the opposite side of the board. 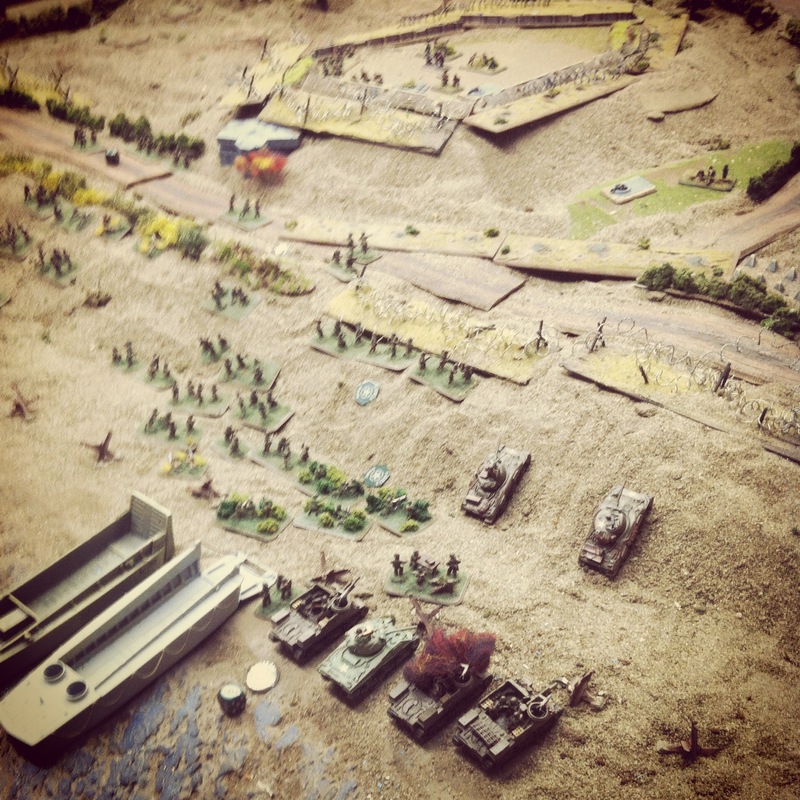 Games are scored by destroying units or securing objectives like bridges. 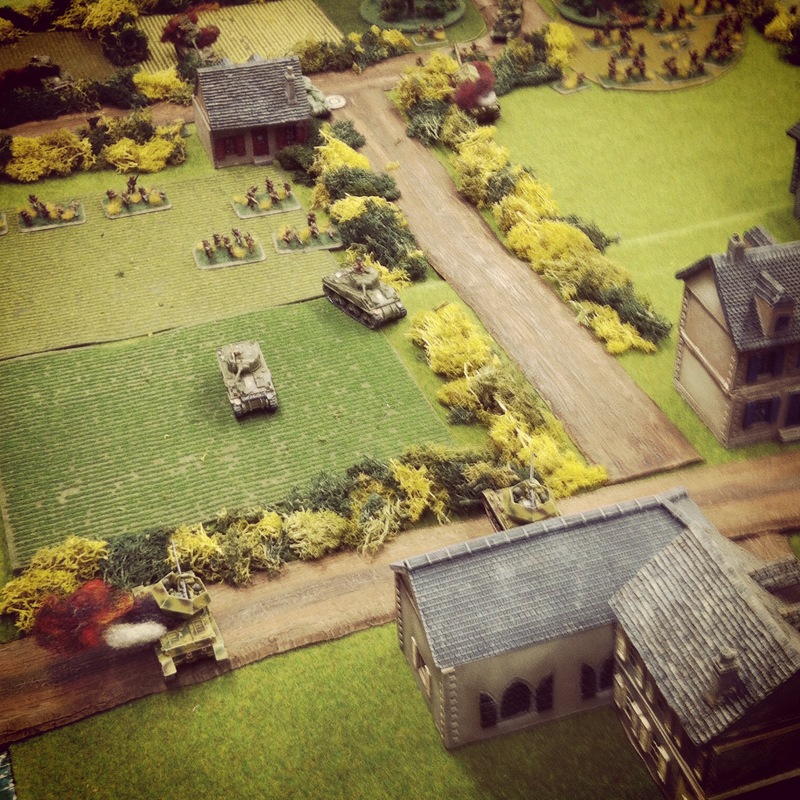 As fairly experienced WWII historical miniatures players with Flames of War, both my son and I were pleasantly surprised by the fun to be had with Memoir ’44. 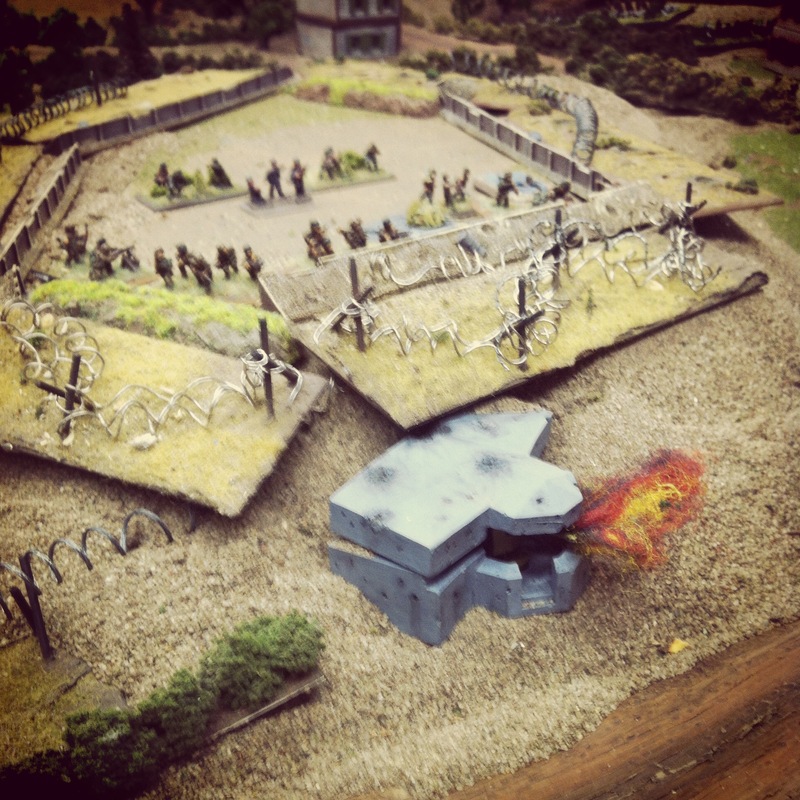 The intro scenario is for Pegasus Bridge which we tackled in about 20 minutes to get a feel for the game. 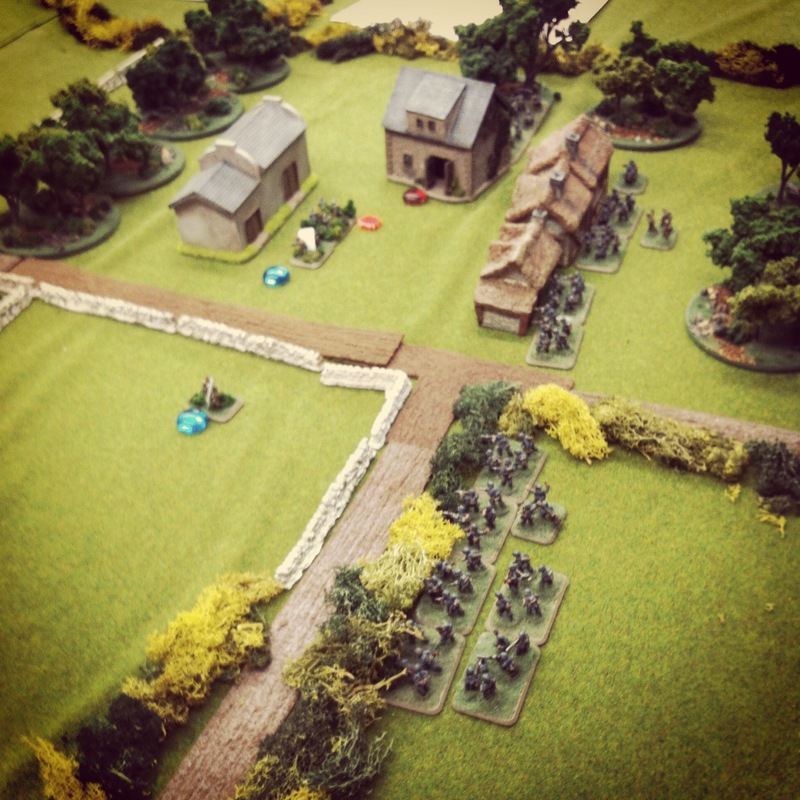 Next up, we tried Sainte-Mère-Église with a fun added feature of actually dropping a fistful of paratroopers onto the board. We both found the command cards to be a good mechanic to represent the effectiveness of delivering orders on the battlefield. In out second game, my son’s tanks lay parked at the corner of the board the entire game since he never drew a card allowing activation of units to his left. We each pulled a couple special cards, allowing things like airstrikes and close assaults to happen as the game quickly moved to a finish in about four or five turns. With the basic rules under our belts, we’re anxious to push on through the remaining scenarios included in the basic rules. 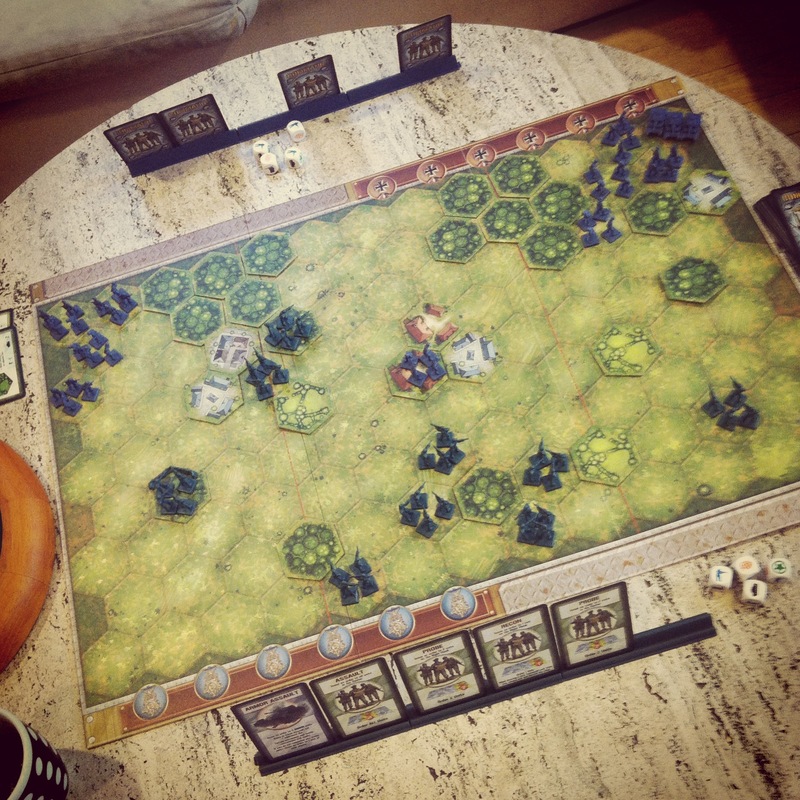 The scores of available official scenarios, expansion editions, campaign books and army packs add an amazing amount of replay value to Memoir ’44’s basic rules and mechanics. A nifty online design scenario design tool also allows armchair historians to have a go at creating official-looking games of their own, and I can just imagine the educational possibilities in using it in school settings. Along with the base game, I snatched a copy of the Terrain Pack expansion which offers nearly 150 additional tiles, markers, special unit tokens and four additional scenarios. 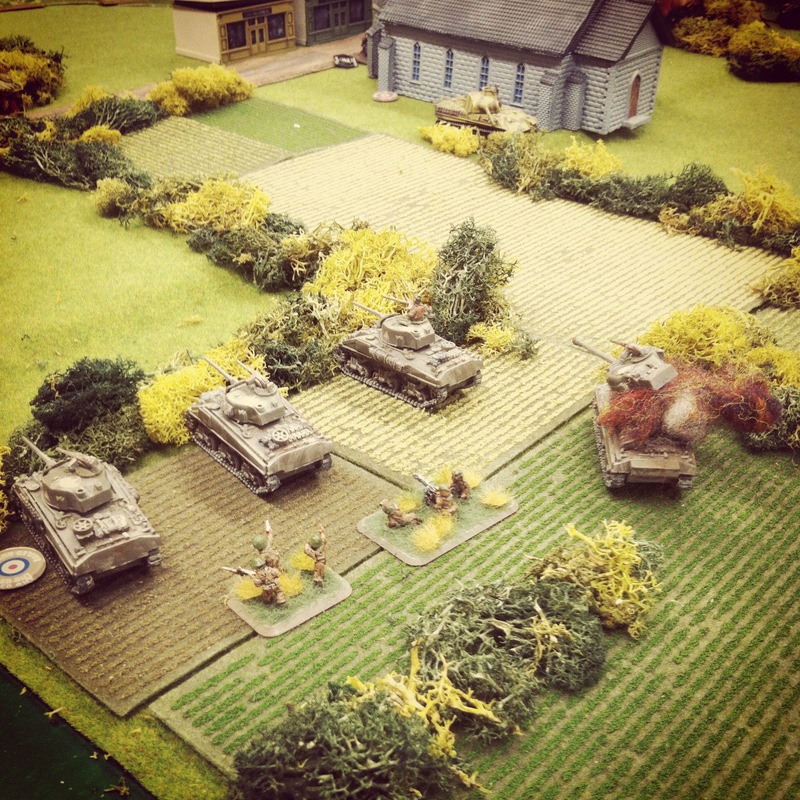 With the vast expansions of Memoir ’44, just about any interest in the air and land battles of every major front in WWII can be endlessly played and explored. 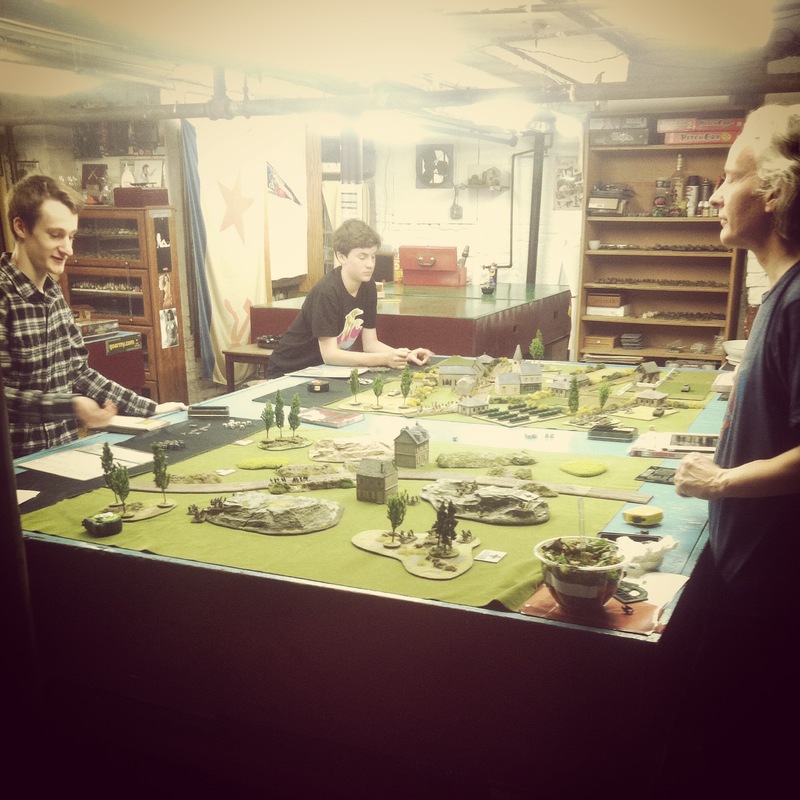 I realize I’ve just begun with Memoir ’44, and I’m certain to have both my boys playing along with me. 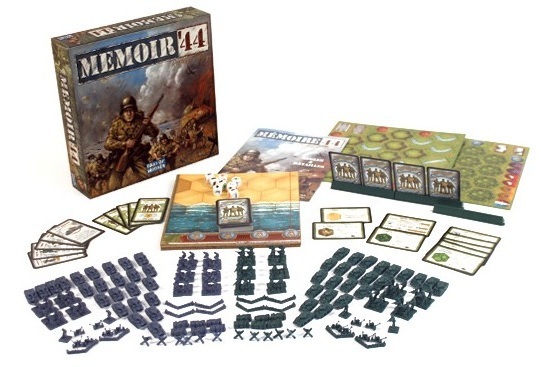 There’s so much appeal in Memoir ’44 for kids or adults who have dabbled casually in war-themed board games like Risk or Stratego, plus the added interest of easily replaying historic WWII battles. 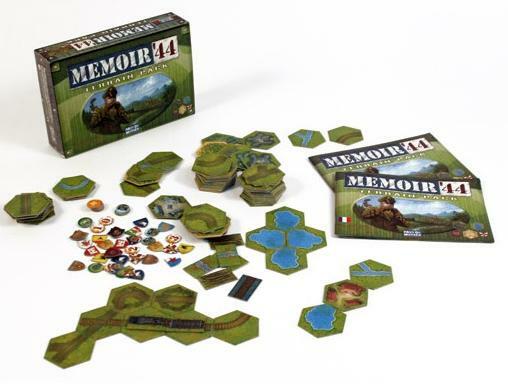 Quick games, some real history and a fun box of toys — Memoir ’44 brings the complete package to the table.